I've heard the same calls go out on the scanner: people hauling metal out of Civic Park, say at noon, but the call is dispatched 8+ hours later. I haven't had the heart to drive up there and see it for myself. 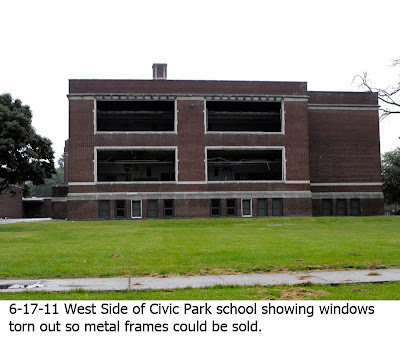 I just read that Coolidge Elementary here on the west side closed at the end of the school year. I wonder how long it will be until it's stripped clean. My Father in Law is Erwin L.Davis who the Administration building for Genesee County School District was named after because years ago he was the Superintendent of the Schools in Genesee County. He is in his 90's and retired, I imagine if he was aware today of the situation of the schools in Flint today he would be very upset! Hate to say it, but Civic Park seems like an arson waiting to happen. Isn't Longfellow now sitting empty awaiting the same fate? I went to school there K-9. All those bricks must be worth something too. Certainly they could be re-used in other buildings. Why not hire a team of people to disassemble the building (not just demolish) from the top on down like they did in the late 19th early 20th century. Those materials carted away over a series of weeks to be used again, would be a much better choice than a building standing as some inert reminder of the past. Exactly. There's value in this building, obviously. I'm wondering if the city couldn't figure out a way to offset the cost of demolition by stripping the building and coordinating with organizations that might want the materials. I know the city is broke, but just letting these buildings get fleeced until they burn down is ridiculous. It has to be a huge blow to morale to city that's already suffering immensely. Coolidge has a Presidential portrait signed by Calvin Coolidge himself with a note thanking the city for naming the school in his honor. Wonder if they will safeguard that memento before they turn out the lights. 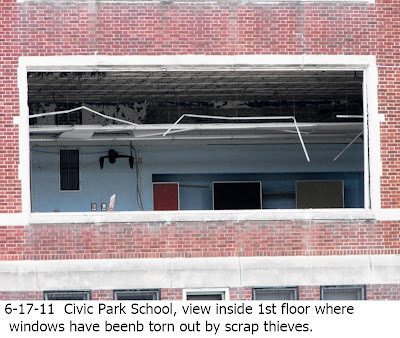 Btw, Homedale School, a victim of arson and internal structural failure is even more pathetic to view. Many teachers loved working there, and it was closed in the service of racial politics. Very disillusioning to see that happening. 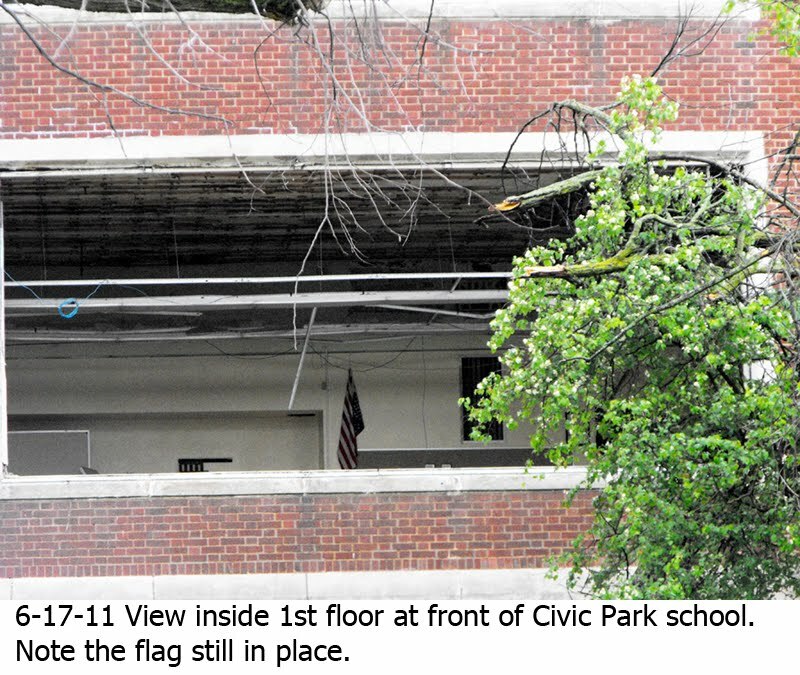 Civic Park was a great school and a nice building. I wonder how big that tree in picture 2 was back when I started at Civic Park in 1960? Sure hope no one burns it again. I witnessed the school burn back in the early 70's. I remember the kids in the neighborhood dancing with glee when it burned in the 70's. The glee vanished when they learned that arrangements were made for them to continue with school. Longfellow - we drive by it daily, & never see any damage. It could be because the board is using it as a warehouse & there's constant traffic there. Plus, the windows are boarded. Civic Park has practically nothing boarded up. PS - lived in the area since 68 & not going anywhere. I was one of those kids dancing before (eventually) having to walk to St. Luke's (??) to continue school. I watched that fire and think I may have ended up in a newspaper photo taken while it was burning. Very sad to see, and even more sad that the Flint city police are too financially strapped to be able to respond. 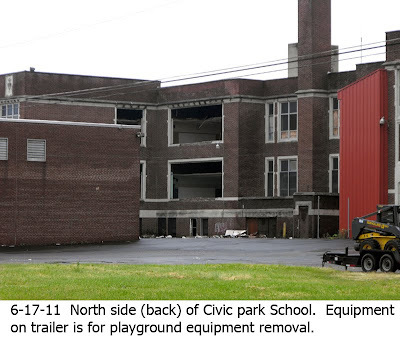 Interestingly the rebuilt Civic Park school reopened on December 5, 1972, less than 9 months after the fire. 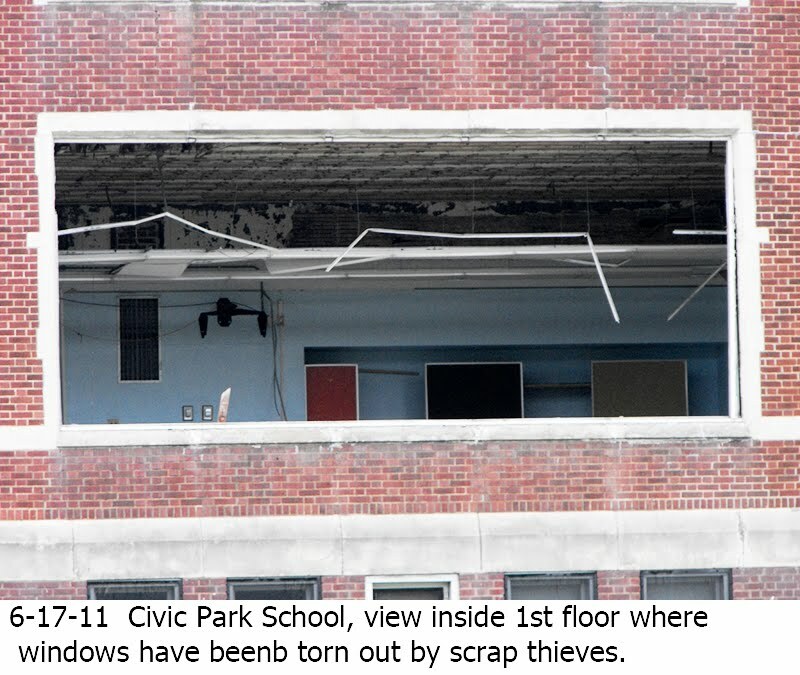 I would be happy merely to see the current school boarded up and secured within 9 months of the current destruction by these thieves. But I am not that hopeful given the current state of the city and the amount of time required to get building projects started even in viable cities. 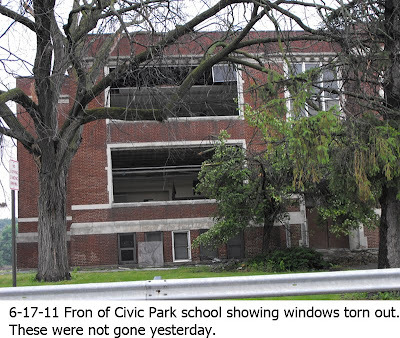 There had seen some talk of reusing the school for senior citizen housing, but I have not seen anything recently on that in the Flint Journal (which I try to keep up on from afar). The former students of Coolidge has set up a Facebook page for people to post their memories of the school, Mr. Zellers, Mr. Jorgensen's Brown Bomber, or roller skating in the gym. Whatever brings back a memory for you. Time capsules were buried in the 70's and we would like to meet up for a mini reunion and see if we can find them. At least before the school turns into a boarded up crack house. Come check out the page...you may see some faces you haven't seen in 40 years. Wow... this explains why both Central and Whittier had mesh metal cages installed on all reachable windows after the buildings closed. I'm an oldie-moldie. I attended Civic Park from 1941-1947. I loved that school. I remember names of teachers that I didn't like...Mrs. Murray(art teacher)never said anything nice about my pictures. Mrs. Allen(music teacher)just an old crabby bitty. Loved Mrs. Johnson, my phys. ed. teacher. Never kept in touch with any friends from that era. Most are probably dead by now. The kids hated going to the basement floor where there were showers. It was spooky down there. Joyce O.
I attended CP fm 41 to 47 also, & then Longfellow & Central. Had Miss " Love" for 1st grade. Test reached. Read Tom Sawyer & Huckelberry Finn the summer after 3rd grade & have been reading ever since. I went back to visit Mrs Casset during 9th grade & she picked 2 spelling/penmanship books off her desk; they were my first & last books! I wrote better then than now! Joyce, good to hear from you. Just curious...where'd you live in the neighborhood? Gordon, I lived on Dupont St. across from Dewey Woods. Civic Park was about a mile away. My brothers, Tom & Doug were hellions. My younger sister was a more quiet kid. My brother Doug wrote a story about Civic Park and he's trying to get it published. 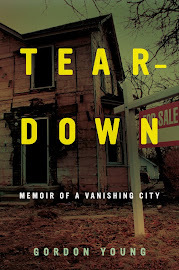 Most of it is fiction, but he uses the environment of Civic Park, old friends' names, and long gone teachers' names. 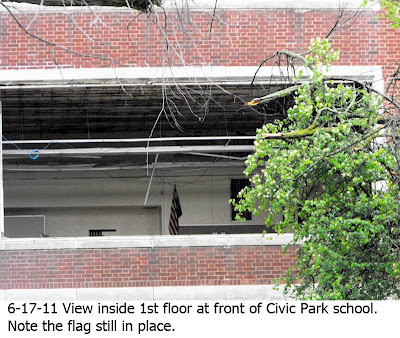 I attended Civic Park in 54-55 - Mrs. Rumbolt was my 6th grade teacher. We lived on Landon and then moved around the corner to Brownell (opposite the Bassett Park woods). Previously, I had attended Coolidge from 48-53. 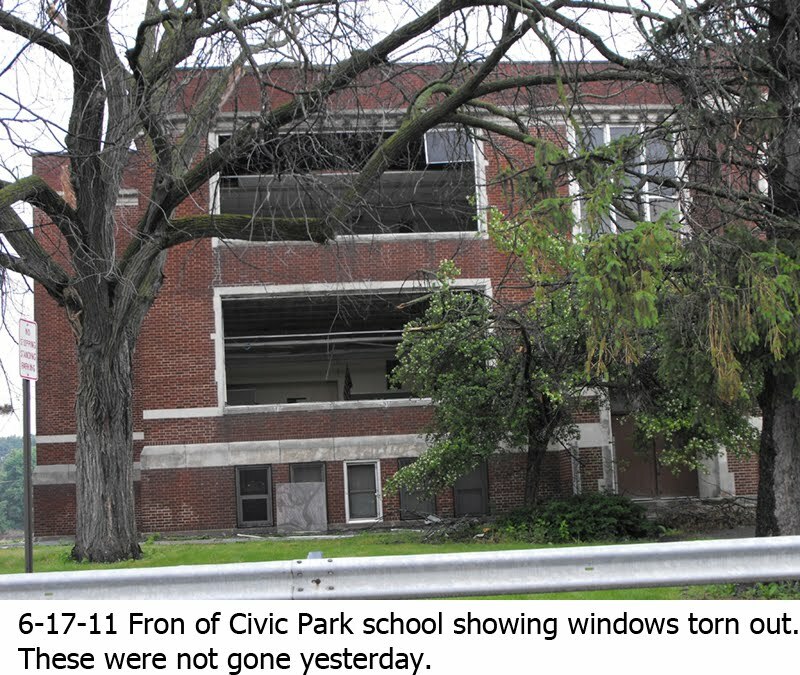 Now all five Flint schools I attended are either closed or demolished including Longfellow, Central, and Northern. Lynn, I know the feeling. At various points, I attended Homedale, Civic Park, St. Mike's and St. Mary's. All closed. Homedale's a big grassy field. Joyce, if it's convenient, ask your brother to send me the story. I'd love to read it. I would love to read the story also! I dream of writing my books of my childhood at Civic Park! Happy Days! I went to Civic Park from 1956 to 1961. I loved the playground, especially the flying carpet. I lived on W. Dewey St. and rode my bike to Forest Park (also called Dewey Woods).